The BodyTalk System seeks to address the "whole person". BodyTalk finds the underlying causes of illness by addressing the whole-person and their whole-story. The BodyTalk techniques provide insights to the areas of your body that need attention. What might seem like an obvious problem to you is not necessarily the one your body wants to address first. This is the beauty of BodyTalk. It respects the body's own needs and determines your body's priorities for healing. Every choice, and every experience in your life, has contributed to your current state of health. Each scar, laugh line and injury has a unique story and a history. Your life-style, genetics and history are all drawn upon to establish a personalized approach to Healthcare that brings about lasting changes. BodyTalk is designed to integrate all fields of healthcare to create a complete approach to health and well-being. This includes referring a client onto another Healthcare practitioner or field of healthcare when necessary. Tapping on the body to get it to focus on healing has been used by some indigenous holistic systems, such as yoga, for centuries. For BodyTalk specifically, tapping on the head tells the brain to "fix" the faulty communication circuit and the heart to "store" the fix. This activates the brain and helps to facilitate the body's own ability to restore and maintain its optimum health. For every malfunctioning energy circuit or formula found, you or your practitioner may hold the corresponding "points" with your hands, in order to help provide focus. You may also breathe deeply, as this helps your brain scan the body to locate the imbalances. The practitioner then lightly taps you on the top of the head, which stimulates your brain and causes it to initiate corrections to the broken circuits. This is similar to how the CPU of a computer runs the programs and makes all the calculations. Your practitioner then taps you on the sternum to "save" the corrected energy circuit in the heart center and to share this information with every single cell in the body. The heart is responsible for communicating the state of the body's health to the rest of the body through the heart beat. This means that your body will remember these changes after the session, just like hitting the save button on a document will save changes to the computer hard drive so you can access them again later. One of the major areas addressed by The BodyTalk System is the realm of personal and spiritual growth. 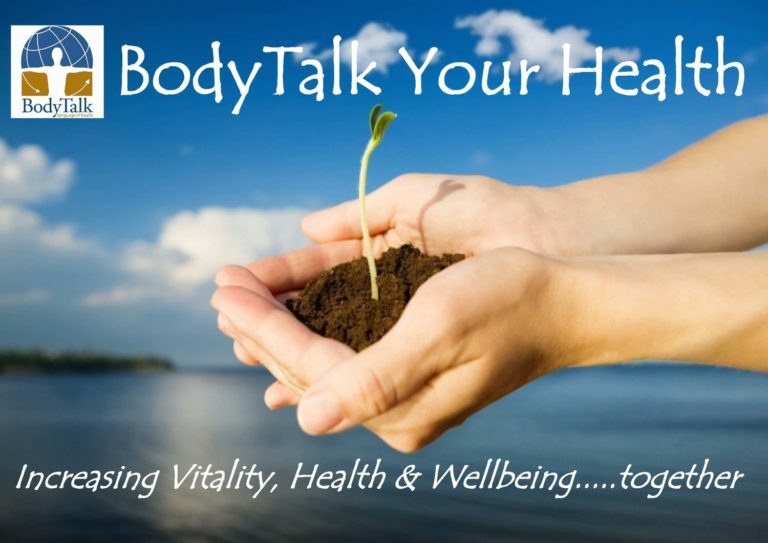 Balancing the body biochemically, physiologically, and emotionally, while addressing specific beliefs and attitudes, the BodyTalk System is a very powerful tool in the field of personal development. Practitioners and clients alike can experience changes in the way they relate to others, as well as the relationships they have with friends and family. Many individuals find new jobs or improvements within the work they are currently doing and also find an increase in the overall wellness and real happiness they experience on a daily basis. The personal development experienced through BodyTalk can affect an individual on all levels, in all ways. BodyTalk is based on the principle that the body is capable of healing itself at all levels - as evidenced by the healing process that is automatically initiated when a person cuts a finger or twists an ankle. This automatic, self-guided healing process is part of the body's inborn intelligence, or the "innate wisdom" of the body, as we call it in BodyTalk. Every single cell, atom, and system is in constant communication with every other cell, atom and system within the bodymind complex at all times. This includes communication through the nervous system, as well as the other subtle energy circuits of the body - such as the meridians and the electromagnetic frequencies that are produced by the body through its functioning. Stress we experience in our daily life can cause these circuits to become compromised, weakening or disrupting the communication between the cells and systems. BodyTalk helps to re-establish these energetic circuits and efficient communication in a quick and effective way, which then allows the body to very quickly recover and catch up in the healing process. This is witnessed in how quickly symptoms disappear and function returns, often within just one or two BodyTalk sessions. The BodyTalk System also uses concepts from the fields of Information Science and Information Management, Dynamic Systems Theory and advanced process control and optimization principles found in the engineering fields, as well as advanced topics in mathematics and quantum physics. Even though these fields may not seem to have an obvious connection to the healing processes of the bodymind, they are an integral part of how the BodyTalk Practitioner is able to quickly and easily gather relevant information from their client's body. The BodyTalk System protocol chart is a flowchart that represents a map of the bodymind complex. Each section of the chart addresses certain aspects of the bodymind, including all physical, mental, emotional and energetic frequencies found in the body. This chart and the procedures to utilize it represent the left-brain side of the BodyTalk process. The experienced Practitioner then uses their right-brain intuitive process to complete the communication formulas which the bodymind complex then transforms into healing stimuli.